We sensitize the public on proper road use and above all we conduct training to the road users on road safety tips and first aid on the road in case of accident emergency. We are currently aiming to continue training more Traffic Officers, Bodaboda riders and taxi drivers through their governing bodies. Our recent Road safety training benefited over 100 Bodaboda riders and 50 Traffic Officers. 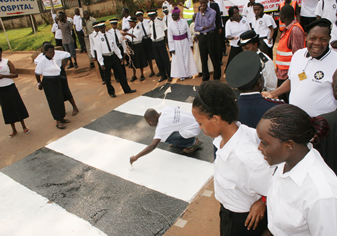 St John Uganda over the years has been very active in the exercise of road marking and the recent intervention was a Zebra Crossing painted by St John Uganda in partnership with Kampala City Council Authority (KCCA) on Bombo road during St John day celebrations of 2012.